Automatic versatile speed in-line continuous motion shrink wrappers with side seal and trim film enclosure. Available in four versions to accommodate a variety of applications. American Packaging Machinery, Inc. offers various specifically designed product handling and control systems for the MS Series systems. Each transfer point is designed for the products to be used on the machine so efficiency and simplicity are inherent in each system. We do not expect your product to accommodate our machine, rather APM designs machinery to accommodate your product. Heavy duty 2″ x 3″ and 2″ x 6″ tubular steel welded frame with 7-gauge wall thickness. This heavy duty frame reduces vibration and assures smooth product transfers. Machine drives and control systems are specifically engineered for the products to be wrapped to assure harmonious interaction. Single wound, side load film rack to facilitate easy film loading. Includes roll adjustment wheel to provide film adjustments easily. Fully adjustable film inverting system will accommodate a variety of product and film sizes via hand crank adjustments. Choice of in-feed conveyor type to provide positive product transfers and pacing through the system. Includes product specific adjustable guides. Side seal and trim film closure system utilizes hot wire with adjustable pressure for positive, consistent film seals with a variety of film types. Includes wind up scrap removal system. Multi-zone vacuum belt conveyor for consistent and precise product/film advancement. Heavy duty belted seal conveyor. Choice of continuous motion seal carriage designs for various production requirements. Choice of custom solid seal bar design or nichrome wire seal bar to accommodate a variety of film types. Seal bar widths ranging from 18″ to 35″. Automatic versatile speed in-line continuous motion shrink wrappers with vertical cross seal, side seal and trim film enclosure. Available in four versions to accommodate a variety of applications. Single-zone vacuum belt conveyor for consistent and precise product/film advancement. Seal bar widths ranging from 14″ to 24″. 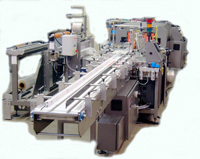 Automatic, versatile speed, in-line continuous motion shrink wrappers with static overlap bottom seal. Available in four versions to accommodate a variety of applications. American Packaging Machinery, Inc. offers various specifically designed product handling and control systems for the ML Series systems. Each transfer point is designed for the products to be used on the machine so efficiency and simplicity are inherent in each system. We do not expect your product to accommodate our machine, rather APM designs machinery to accommodate your product. Dual roll film rack with one fixed and one pull-out rack to facilitate easy film loading. Includes roll transfer system and roll adjustment wheel on fixed rack to provide final film adjustments easily. Product specific fixed film forming plows. 20 KV electro static generator and power supply for over lap bottom seal assures strong seal at any speed. 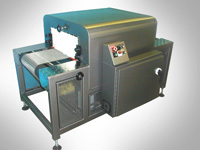 Will accommodate a variety of film types and gauge thickness. Film break and run-out detector with stop cycle to maximize efficiency. Automatic, versatile speed, in-line continuous motion shrink wrappers with vertical cross seal and static overlap bottom seal. Available in four versions to accommodate a variety of applications. American Packaging Machinery, Inc. designs and manufactures our own shrink tunnels in house to be the most efficient, longest lasting, and most reliable available in the marketplace today. American Packaging Machinery, Inc. incorporates components usually found on high speed equipment into a system having a length of less than eleven feet providing production speeds exceeding sixty packages per minute and conserving valuable floor space. Heavy duty 2″ x 3″ tubular steel welded frame with 7-gauge wall thickness. Heavy duty stainless steel mesh belt tunnel conveyor. This provides for bottom air flow and positive film shrinkage 360 degrees around the product. Includes grooved pulleys for tracking and self cooling design for long life. Nine 7/16” diameter tubular heaters surrounded by steel supports. Includes insulated wire connections for long life and reduced maintenance. Heavy duty 1.5 horse power blower motors with dual turbine design is bottom mounted to provide positive air control and efficient operation. Assembly can be accessed from outside of the tunnel chamber for safety and minimal maintenance down time. 3″ and 5″ thick tunnel chamber insulation for maximum heat retention and “cool to the touch” outer chamber contact. Adjustable air baffles provide precise air direction control to assure the best possible finished product appearance. Variable frequency controlled blower motors for precise air velocity control. Top and bottom air flow control adjustments. Externally mounted. Provides infinite adjustment from fully closed to full open. Various shrink tunnel belt materials available.